So What Exactly is a Puppy Bumper? It is a stuffed collar (filled with polyester fiberfill so they are light but firm) that resembles a relaxing travel pillow (for humans) used to prevent puppies and small dogs from squeezing through fences, balconies, and gates. 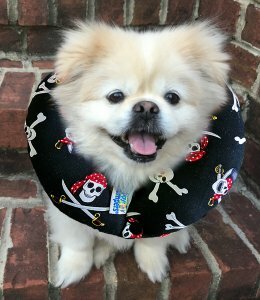 Small dogs and puppies can be safe and stylish because Puppy Bumpers come in a variety of colors and fabrics. There is even a gold "bling" Puppy Bumper for the dog that likes to stand out in a crowd. For dogs with neck sizes ranging from 13" - 16"